This coming Sunday has three fun events to chose from — for those of you near Portland that is. If you're really fast maybe you can even squeeze in all three! First of all, my fellow bloggers Tamara (Chickadee Gardens), Amy (The Worlds Best Gardening Blog) and I are participating in a class/discussion at Joy Creek Nursery called Garden Blogging as a Tool. 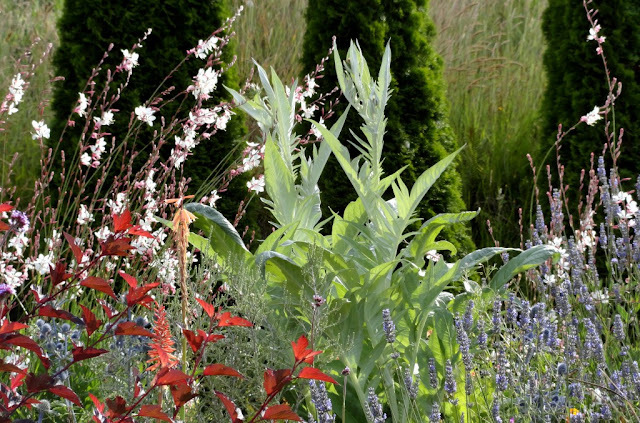 We will explore how garden blogging can be used to build gardening communities. We all came to blogging for drastically different reasons, but enjoy the community — local, national and international — we are now a part of. We have lots to talk about and hope for an engaged audience who will ask the tough questions. The class is free and open to the public, it begins at 1:00 pm. Of course while you're there you'll want to explore the Joy Creek gardens and shop the nursery! (I know I will be). Secondly, the garden of Bob Hyland and Andrew Beckman is open to benefit the Pacific Horticulture Society. 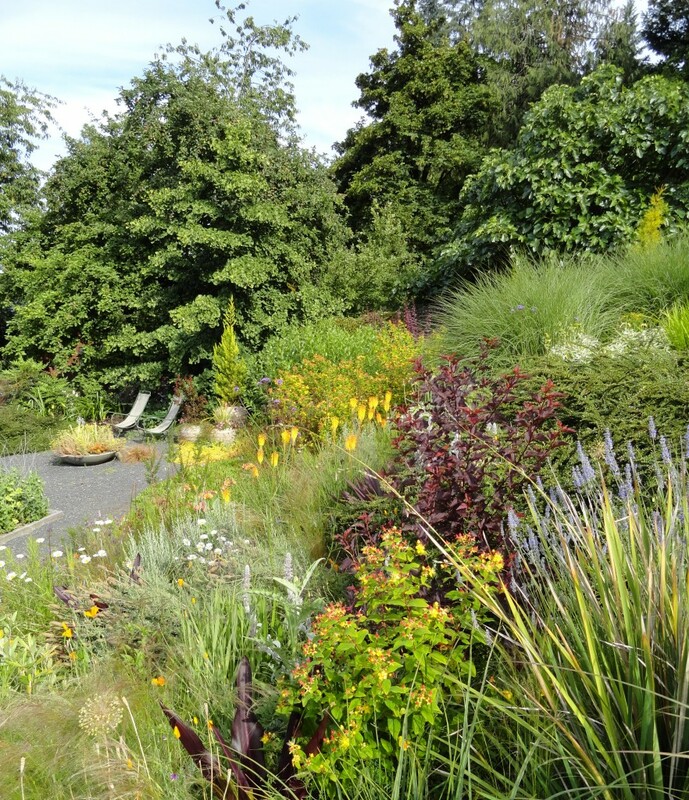 This five year old garden is perched on a hillside above Highway 30 (with views out over the Willamette and Columbia Rivers and bits industrial north Portland), if you're looking for an afternoon spent in a beautiful garden to benefit a great organization, then this is an event for you. I visited earlier in the year and wrote about my visit here. The garden is open from 2:00 to 6:00pm and the cost is $40 for PHS members, $45 for non-members and guests (more info). And finally if you thought tour season was over you're wrong: five gardens on Portland's west side will be open Sunday to benefit Ainsworth Elementary School. 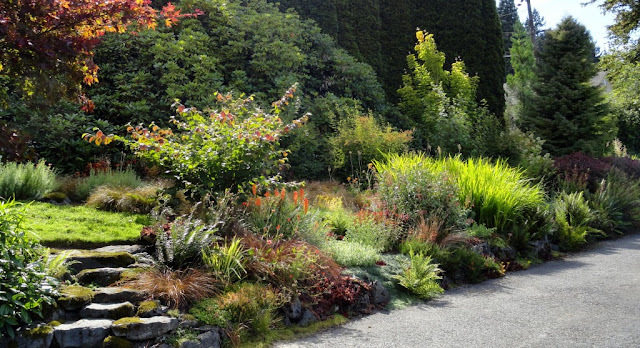 One of the gardens on the tour is the Dietrich garden, which I had the opportunity to visit a couple of weeks ago via the HPSO open gardens program. Another gardener on the Ainswoth tour, Ellen Novy, kindly opened her garden to Tamara, Amy and I as a sneak peek. We enjoyed poking around her property as well as that of her gardening neighbor, who's property will also be part of the tour. This tour takes place from 11:00am- 4:00pm and the cost is $30 (info here). Hope you can make it out to one, two, or (somehow) all three of these events! I wish I could! Good luck on your blogging presentation at Joy Creek! Now that is my idea of gardening neighbors! Hope you will write a little about the blogging discussion. I'm sure we'd all be interested in what the three of you have to say as well as hearing about some of the Q and A if that's possible. I will do my best to report all the news that's, well, news! What they said! My Sunday job starts on that day so I can't make it but am very interested in hearing the presentation and hope that you can post a link to a video or audio recording or blog about highlights. Damn, I forgot about something else important that happens on Sunday...your birthday! I don't think any place feeds a gardener's soul the way Portland does. Best wishes with your talk! Woo hoo! Really looking forward to our Joy Creek event, thank you so much for coming! And thank you for including me. Looking forward to seeing you at Joy Creek! Congrats to you and your cohorts. It'll be a wonderful day. Great photos! I would be all over these if I were about 500 miles closer ! That Joy Creek gig should be filmed for all to see ! You ask the questions and we'll do our best to answer them. Wow, you guys are so lucky to have so much going on! Indeed we are. When are you guys moving here? Oh, how I miss Portland, a city full of life, with its beautiful parks, gardens and nurseries! Left it in 1995 and still miss it. How did I not know you used to be a Portlander? Gorgeous photos of sumptuous gardens and, oh, that nursery! Wish I were there.